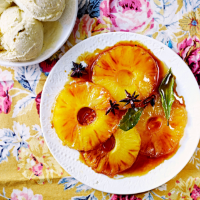 1 Sprinkle the sugar into a large frying pan and add the pineapple and star anise. Cook over a medium heat until the sugar melts and turns chestnut brown; watch carefully. 2 Add the bay leaves and 100ml rum, tilting the pan to flambé the pineapple; take care and stand well back. Let any flames subside, then boil until the liquid turns syrupy. 3 Add the butter and 200ml water. Simmer for 7-8 minutes, until the liquid is a thick syrup, then add the remaining 50ml rum. Leave to bubble and thicken for a few minutes more. 4 Remove from the heat and leave to cool for 3-4 minutes. Serve, with ice cream, if liked. This recipe was first published in Sun Mar 01 16:01:00 GMT 2015.